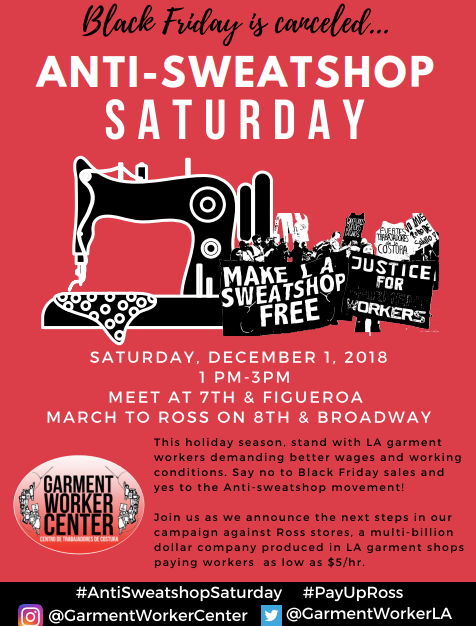 The Garment Workers Center in Los Angeles is calling upon the public to stand with garment workers for their “Anti-Sweatshop Saturday” on December 1, 2018. During this holiday season it is important for people to stand with the LA garment workers and demand better wages and working conditions. During this season it is important that we also consider making ethical choices in what we purchase and where we buy from this holiday season; so that we do not support businesses which thrive off of sweatshop labor. Unfortunately, this problem hits more close to home for more discount bargain buyers than you might imagine. Certainly there have always been sweatshops in Los Angeles – piece sewing garment shops that are often dangerous and which pay less than the legal wages. Historically these sweatshops have long thrived off of immigrant labor; often taking advantage of new immigrant and undocumented laborers. Though the seriousness of the current conditions in the 21st century shocked me to the core as it was explained to me by local garment workers themselves of how widespread this is. And how many major stores my own family shop at buy and sell sweatshop garments. This story hits close to home for many of us. Especially for working-class people in immigrant communities. A few years ago I began to volunteer doing community organizing in the neighborhood of Pico Union; a working-class, immigrant community near the Downtown Los Angeles Fashion District. When I was brought in by the Pico Union Project my work started with surveys and listening sessions. Before I did anything we partnered with IDEPSCA – the Instituto de Educación Popular del Sur de California – which represents the largely Salvadoran community of laborers in the neighborhood – we set out to get to know what the needs and concerns of the community were. The two items which topped the list of needs and concerns for the neighborhood were not so surprising to us: housing and jobs. If you consider it, most American consumers think that their clothes are made in some other county. That they are made for cheap in Asia or Latin America where impossibly low wage are legal. Consumer accept this because they think this human suffering is a world away. So they feel less guilty about it. However, the truth is that many clothes you will find on the rack are made in sweatshop conditions here in Los Angeles, often made by Central American and Asian immigrants in our very own city, for less than legal wages. When I began to talk to our neighbors about this I soon realized that every person I was talking who worked in the garment shops in our area were being paid somewhere between $4.75 and $5.15 per hour; far less than the minimum wage in the City of Los Angeles. Now with that low of wages, consider how hard it is for a family to pay rent for an inner-city home or apartment; and how many people under one roof it takes in order to just pay the rent alone. Many families are on the verge of homelessness because of illegally low wages they are paid, and the ever-growing rents as these urban communities begin to experience gentrification. And that is just scratching the surface of what the difficulties and injustices these workers face. But how did this problem get so wide-spread? And why is of such consequence to the people of our city? In the past it was true that many garments were made overseas; outsourced to other countries and shipped here, in order to cost less than it would be to make in the United States. However, there began a shift in the garment industry in past few decades. If you look in your closet you will even find clothes labeled from places you would expect, like China and Bangladesh. However, in many cases these garments were sent in pieces from abroad and sewn together and decoratively finished here in Los Angeles sweatshops. Now if you’re not necessarily a fashionista who follows fashion seasons, you might not appreciate how this came to be. So let’s break it down. In other cities there are generally two or four fashion seasons annually, which define the style of clothing produced in that city for the year. Though in Los Angeles, in contrast, shops began to pull off amazing turn-around times in garment work, enabling as many as twelve fashion seasons a year; so a retailer could have a new product line in their shops every month. Even more recently, some retailers begun to demand new and cheap products every two or three weeks, even every week in some cases. This is only possible by doing the final sewing and decorative work stateside. The pieces coming in by import from Latin America and the Pacific Rim through the port of Los Angeles, and finally being pieced together in rickety sweatshops lining the downtown Fashion District and surrounding communities. And this is how Los Angeles became the largest manufacturer of clothing in the country, producing garments which are sold at Macy’s, Nordstrom, Forever 21, Urban Outfitters, Burlington, Dillard’s, TJ Maxx, and especially Ross. It’s very simple to understand this system of exploitation. Retailers are paying suppliers less, which in-tern are paying laborers less, just so consumers can buy throw-away fashion. And that is the heart of the problem. People don’t question where they are getting their products from, and few consumers are holding their favorite retailers accountable to buy sweatshop-free garments. Let me give you some real world examples of this culture of exploitation and wage theft. In 2016 YN Apparel, a supplier of clothing for Ross Stores, was officially charged by the California Labor Commissioner’s Office with contracting with factories which paid workers as little as $6.00 per hour. YN Apparel agreed to pay $212,000 in back wages. Though the investigations found that Ross would have had to pay their supplier twice as much in order to pass on a basic minimum wage to the factory employees. “The Times reviewed more than a dozen claims for back wages filed with the California Labor Commissioner’s Office in the last two years, from workers who say they were compensated with irregular checks. “Rosa Murillo, a senior deputy commissioner for the Labor Commissioner’s Office garment unit, said she has conducted inspections where factories require workers to use a check cashing company that operates in the same building as the factory. Some bosses insist that workers collect wages at specified check cashing companies or at the factory itself, said workers, advocates and lawyers interviewed by The Times. “”It appears as if the owner of the garment factory is speaking with the owner of the check cashing place. It’s almost as if they have an understanding to cash the check even though the information is incomplete,” Murillo said. “In a case this year, the Labor Commissioner ruled that JK Mode, a garment factory that later became DHL Apparel, had paid workers below the minimum wage and ordered that the companies pay more than $283,000 in back wages to seamsters. One worker testified that his bosses inaccurately reported that they worked eight hours per day when he actually worked 12-hour days, and made him retrieve his weekly pay from the company, which took a fee of 1%. The company did not appeal the decision. “Moreno said he worked a 54-hour week in mid-July, meaning he received just over $8 per hour. The van operator took $4.50 of his total $450, he said. Though wage theft doesn’t just end there. One of the unfortunate realities of being an undocumented worker is that sometimes they are not just underpaid, in some cases they are not even paid at all at the end of the week, with the employer expecting the employees to be too scared to report the case because they are undocumented; this is also another form of wage theft that the Garment Workers Center and IDEPSCA regularly try to help people find redress for. Though sometimes fighting outright wage theft is hard to win. Often times a shop that is shut down for stolen wages and bad working conditions; they usually close down a few days or weeks, and just open up again under another name. Often at the very same location, and preying upon the same population of local workers. Repeating the cycle of wage theft and labor abuse among those most desperate for work. 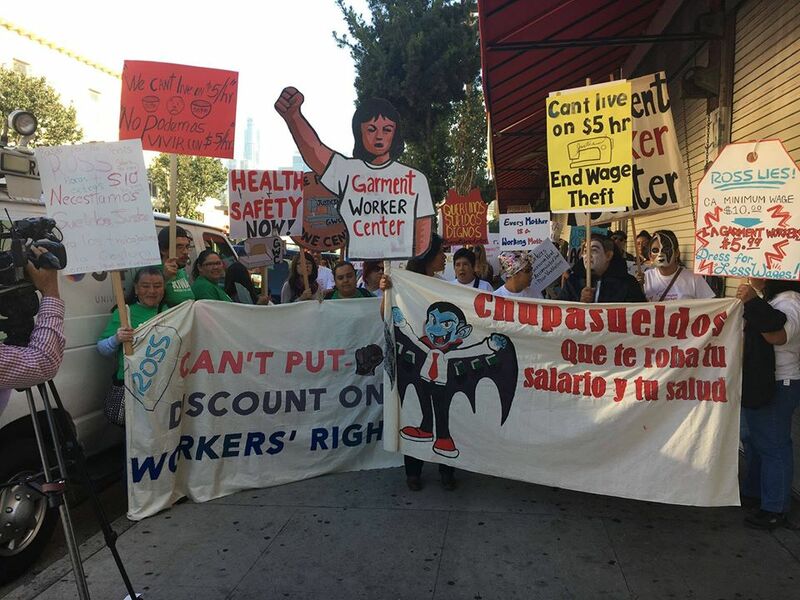 This issue of sweatshop labor and wage theft effects immigrant people from Pico Union and South Central Los Angeles, to Chinatown and Boyle Heights. In all these communities we have hard-working garment workers as residents which are struggling to survive. Though what can we do about it? Do you shop from one of the retailers? This season we are asking people to avoid buying disposable fashion from these retailer! Though we are also asking you to contact the corporate and regional offices of these retailers. Again, the biggest problem there is many of us don’t ask where are garment come from. It is up to consumers to demand of our favorite retailers that they only stock sweatshop-free and fair-wage sourced clothing. And lastly, we need to support the unions and the unionization of apparel and textile shops in Los Angeles. One of the biggest reasons that workers wages are so low and working conditions are so bad, is because of the decline of the unions in this country. 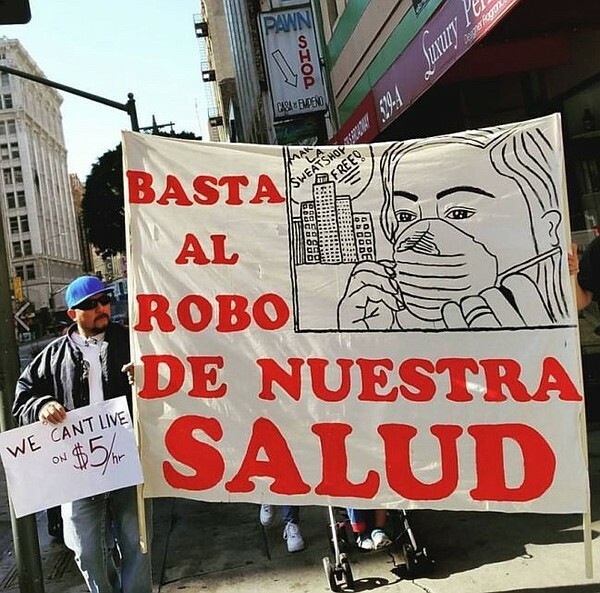 “Basta al robo de nuestra salud.” Stop robbing us of health. 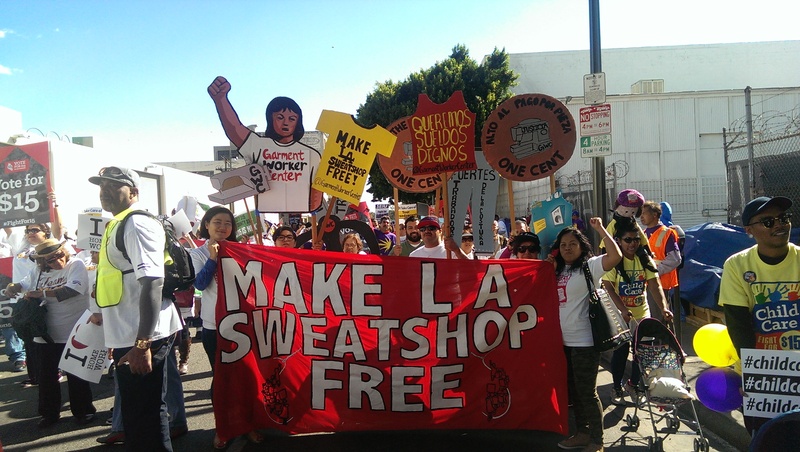 Make LA sweatshop free! As a Jewish American and as a Mexican American, I am well learned in how important the garment industry has historically been for both of these immigrant and working-class communities over the years. Over a century ago, after 146 garment workers were burnt alive in a sweatshop factory their supervisor had locked them into, in the Triangle Shirt Waist Factory fire of 1911; most of them Jewish and Italian women; women laborers fought to unionize garment shops across the country. In 1933 here in Los Angeles Jewish labor socialists also helped bring Latina seamstresses gain membership into the unions for the first time. Improving working conditions and leveraging better wages for many of our own families. Now a century later, all the hard work that we did in union organizing has been rolled back. The new immigrants of today are being exploited and being subjected go dangerous working conditions, just like many of our immigrant forebears were also subjected. We need to stand with the workers who are now struggling in this era. This holiday seasons as you shop for Chanukah and Christmas, make sure to buy and give sweatshop-free and fair-wage sourced clothing! 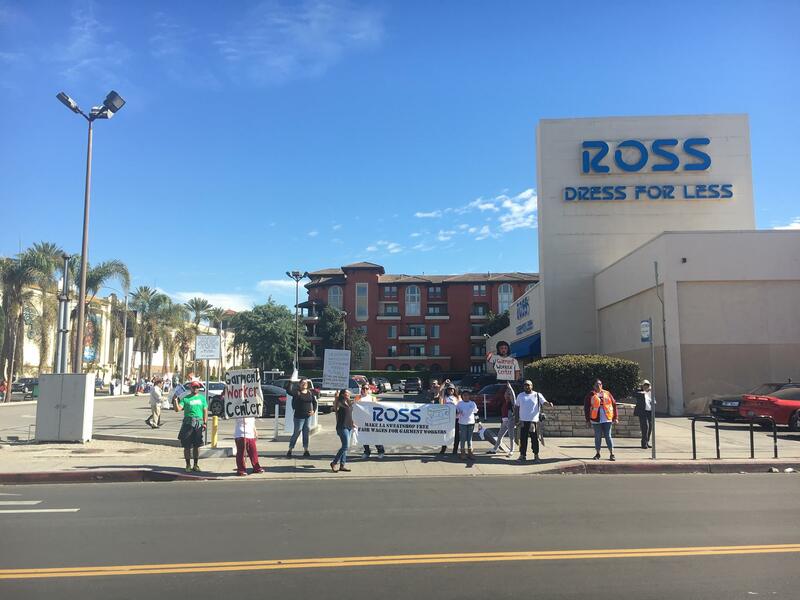 Boycott Ross Dress For Less: This is one of the largest of the sweatshop sourced retailers in our region. Though have you noticed that they keep building new stores in minority, immigrant, working-class communities? 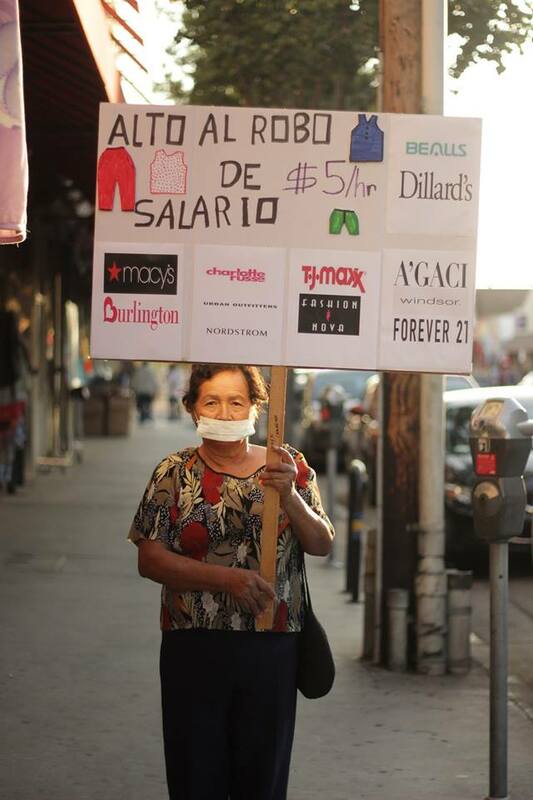 These retailers buy clothing from producers who pay their immigrant workers below the minimum wage, which Ross ends up selling to many unwitting consumers in those very same communities in which Ross is enabling labor abuse and wage-theft. Don’t buy from Ross… no se compensa!